From Facebook and Twitter, to the blogosphere and printed newspapers (and even Wheel of Fortune! 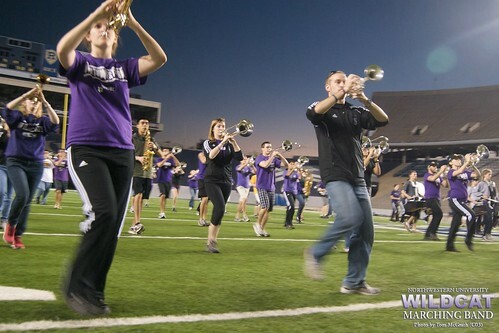 ), here's the all buzz about the Northwestern Bands. July 15, 2012 — EVANSTON, ILL. — "I'm incredibly excited for the great challenge we have in front of us!" says Daniel J. Farris, director of athletic bands at Northwestern University. As the Northwestern football and band schedules have been firming up, it is clear that this season has a lot in store for members of the Northwestern University "Wildcat" Marching Band. "I don't think NUMB has ever reported to campus this far in advance," says Farris. The scores of student musicians, who represent nearly every major and residence hall at the university, are set to arrive on Sept. 2—more than three weeks before fall quarter classes actually begin. They will have just six days to prepare for the Northwestern football home opener against Vanderbilt University at Ryan Field. With no time to spare, first year students will learn the Wildcat band's traditional "fast entry" sequence. The sustained heart-thumping, leg-pumping routine—all while hollering the Wildcat Growl at the top of one's lungs—has been the time honored method of taking the field for decades. It would just as easily fit into the football team's warm ups. Even after the buzzer sounds to end the contest between the Wildcats and the Commodores, the band will not have much time to rest. They will have an extra week of band camp this season to ready themselves for the next home game on the very next Saturday. And the next Saturday. And the next. "It's been a while since we have had four home games in a row," says Farris. The band customarily learns, rehearses, and memorizes all new drill and music for each home game. A "great challenge" indeed. 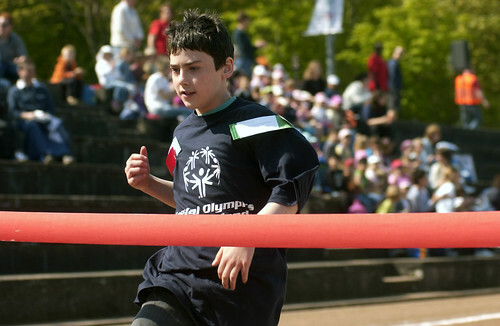 "For this event, we bring 200 Special Olpymics [athletes] between the ages of two and seven along with their families out for a day of fun motor skill activities, lunch, and carnival games," says Nicole Hendrix, executive co-chair of the Northwestern University Benefit to Special Olympics. About two dozen members of the Wildcat Band will be on hand for the opening ceremonies, and will perform the national anthem and other music to kick off the Young Athletes All-Stars Day event. 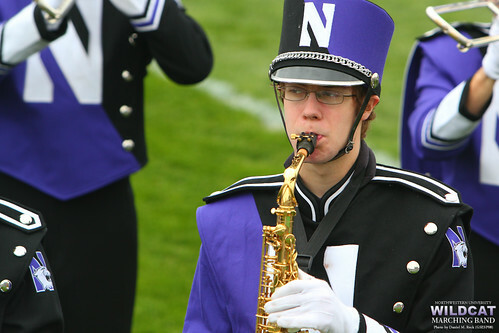 April 20, 2012 — EVANSTON, ILL. — Members of the Northwestern University "Wildcat" Marching Band will once again don their uniforms this spring. Tomorrow, they will be supporting the Wildcat women's lacrosse team beginning at 12:30 p.m. at Lakeside Field on the Evanston campus. The band "enjoyed playing at the women's lacrosse home opener last month," says Daniel J. Farris, director of athletic bands. Festivities at that game included recognizing the team's national champion standing, and concluded with a 15-2 win over the Oregon Ducks. April 13, 2012 — EVANSTON, ILL. — Northwestern University football fans will be catching their first glimpse of the 2012 Wildcat football team and the 2012 Wildcat Band this Saturday. Wildcat faithful are invited to Ryan Field on the Evanston campus on Saturday, April 14, to enjoy the annual Spring Exhibition game. Start time for on-field action is set for noon, but there are plenty of reasons to arrive early and enjoy a full day of fun, football, and music from the Northwestern University "Wildcat" Marching Band. Admission and parking for the Spring Exhibition are free. Fans may begin parking in the lots surrounding Ryan Field as early as 7 a.m. for tailgating, and gates to the stadium will open at 10:30 a.m., 90 minutes before the exhibition. "The band will give a pregame performance on the field at 11:50 a.m.," says Daniel J. Farris, Director of Athletic Bands. March 3, 2012 — EVANSTON, ILL. — Horns are flashing and drums are beating at Lakeside Field in Evanston, where the Northwestern University "Wildcat" Marching Band often rehearses on the artificial turf. But this is no rehearsal, it's a celebration of the Northwestern women's lacrosse team at their home season opener match. It should "be a bit of a surprise to the team," said director of athletic bands Daniel J. Farris. Fans have been encouraged to get to their seats early to help celebrate Northwestern's 2011 NCAA championship victory, the program's sixth in the last seven years. The ceremony will include ring distribution, banner unveilings, and "a special musical performance," according to athletic department officials.